Historic Pack Creek Ranch is nestled in the foothills of the La Sal Mountains just a short distance south of Moab. 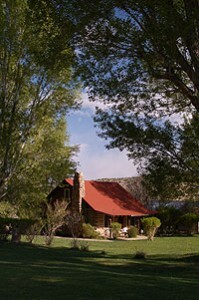 Pack Creek Ranch is part and parcel of the Old West with a history as a working ranch dating from the late 19th century. Legend has it the creek was named when a couple of prospectors shed their packs while being chased by Indians. Today, Pack Creek Ranch retains its whip-sawed look. We offer guests a relaxed and congenial atmosphere, comfortable accommodations, plus the opportunity for a unique Western experience. 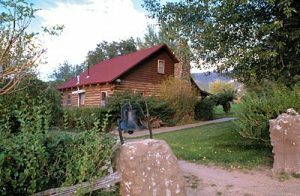 Visit our Pack Creek Ranch Guest Cabins website to learn more, or go directly to the website’s Cabins page to make your choice. 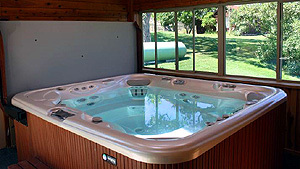 The cozy, private honeymoon cabin has a spectacular sunset view from the living room and porch. The bedroom has a king bed or 2 twin beds. The living room has a queen sleeper sofa. There is a fully equipped kitchen and a bathroom with a shower. Trail's End sleeps up to 4. $175 per night. This is a guest favorite with lots of charm. The combination living room and dining room has a stone fireplace with exposed log construction. The front porch faces east to an expansive green lawn where wild turkeys and deer graze in the evening. There is a newly remodeled, fully equipped kitchen; 1 bedroom with queen bed; a loft with 2 queen beds; and a bathroom with combination shower and tub.